County Controller Margaret Reif (seated center) and staff in the Chester County Controller’s Office, who were awarded the Certificate for Excellence in Financial Reporting. Seated, left and right: Carol Pollitz and Anitha Rajagopal Rao; Back row, left to right: Tacie Himelright, Jenny Suryani, Catherine Advincula and Bob Park. WEST CHESTER — The Chester County Controller’s Office received notification recently of an award bestowed upon them by the Government Finance Officers Association of the United States and Canada (GFOA). 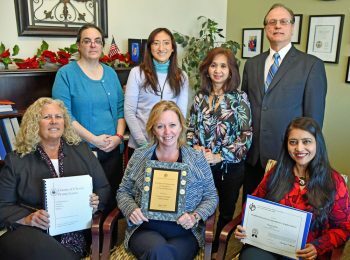 A Certificate of Achievement for Excellence in Financial Reporting was presented to County Controller Margaret Reif and her staff for the 2017 Comprehensive Annual Financial Report (CAFR). A copy of the CAFR can be found on Chester County’s website at www.chesco.org/controller. The award for 2017 CAFR marks the 37th consecutive year that Chester County has earned the GFOA accolade, ranking the county as one of the top in Pennsylvania, and one of less than 60 counties (out of more than 3,000 nationwide) that has been recognizes for 37 years or more. County Controller Margaret Reif said: “Chester County strives to achieve exceptional customer service, transparency, accountability and innovation. Our CAFR document was judged by an independent panel to meet the high standards of the program, which includes demonstrating a clear communication of our financial story.